SFGAmWorld • View topic - Way too early 2020 predictions! Way too early 2020 predictions! I think we are getting either a Zamperla Giga Discovery like SFMM, SFGAdv, & SFFT or a remodel of the kids areas with Camp Cartoon and Hometown Park being expanded and rethemed. Kidzopolis would be completely removed for future use. I think a new water slide will be added to Magic Waters. Yeah, I'd love one of those Discoveries here. staticshadows wrote: I think we are getting either a Zamperla Giga Discovery like SFMM, SFGAdv, & SFFT or a remodel of the kids areas with Camp Cartoon and Hometown Park being expanded and rethemed. Kidzopolis would be completely removed for future use. I think a new water slide will be added to Magic Waters. I agree! Except I think we will get a skywarp in Trail Blazers old site (Due to recent clearing) and a concoldiation of Kidzopolis and Camp Cartoon! Demolishing the Wilderness theater and part of the picnic grove to create one solid kids area! 2021, either a dive machine or something like West Coast Racers in Kidzopolis's old site! If they did renovate/combine kidzopolis,camp cartoon and hometown park. They would turn it into a DC super friends area and a Bugs Bunny Boomtown like the one at Over Georgia. If we did get a Dive Machine I would hope it would be called Deja Vu's Revenge! Just imagine a ride at Six Flags named Deja Vu that doesn't have a lot of downtime! I don’t think Demon is going anywhere until it becomes a major financial headache (literally zero ridership, very scarce parts, extensive downtime). I could see a flat (frisbee or tourbillion) or a kids area expansion and maybe retheme in Camp Cartoon. True... but the past couple of times i've ridden it I rode it 4 straight times because no one else was in line and riding it! And it was 70 degrees and nice weather! If they merge both kids areas and retheme it to Bugs Bunny Boomtown, I could see them installing one of those SBF/Visa kids spinning coasters and theming it to the Tazmanian Devil! Along with a Sprocket Rocket retheme. If I were in charge I would make like a ride like Pandemonium at SFSL.Theme it Tazmanian Devil. I'm thinking a complete redo and expansion of camp cartoon. Hopefully, they demolish kidzopolis. I hope they demolish that and Dare Devil Dive so they can build a new coaster in 2021. And it would work with my Idea that there is a chance we'll get a dive coaster named Deja Vu's Revenge because Deja Vu was in County Fair and near Kidzopolis and Dare Devil Dive. 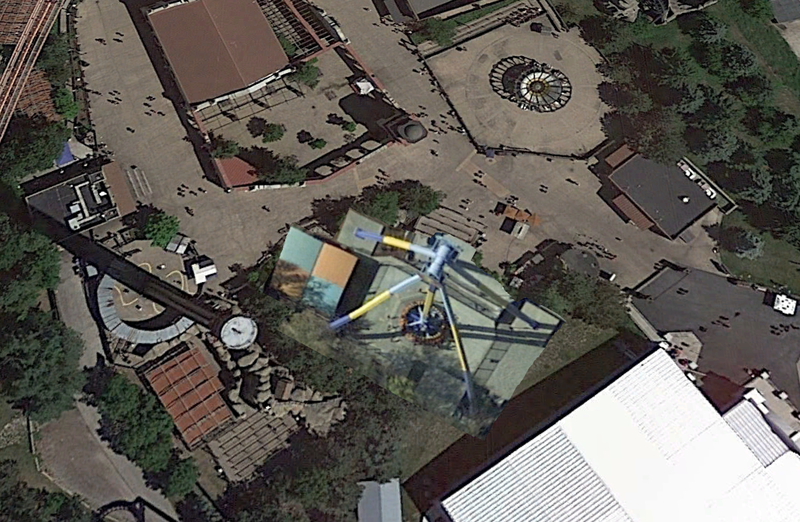 If they go with a Zamperla Giga Discovery for 2020, there aren't many places it will fit without wasting a bunch of space. I wouldn't mind seeing it replace River Rocker in Southwest Territory and a smaller family flat being added to the former Trailblazer location. Wow, that looks awesome! If they did that, they could always move River Rocker to Yukon Territory, where it would honestly fit in a lot better! Back Lot Stunt Coaster in the Black Arrow Coaster's spot. In reality, probably a toddler's ride. I was thinking avout if we could get a giga coaster. We can if they keep it under 330ft. Probably not in 2020 but you never know! I wonder how much a 300 Foot T-REX would cost? B&M Giga's are around $30 Million, I wonder if a T-REX would be just as expensive or cheaper. sfgamnut17 wrote: I was thinking about if we could get a giga coaster. We can if they keep it under 330ft. Probably not in 2020 but you never know! Oh Great! Now someone is going to show up and derail this thread with a bunch of CapEx, Earnings Call, and Annual Report discussion. The cheapest way to build a Giga appears to be T-Rex track (due to cost savings on material) and RMC has already said that T-Rex is years away and the cost only makes sense on large coasters between 300-500 feet tall. They are focusing on a new track size between Raptor and T-Rex next, probably similar to the track size on Skywarps. 2. A Skywarp of some sort in SW territory or a quality redevelopment of Kidzopolis. 4. Also for 2021, we will be getting a T-rex where go-karts and BB were. If/When we get a giant discovery, I would put it where River Rocker is, move the River Rocker where the Revolution is now and scrap it. I would name the new giant discovery Riddler Revenge and put it in Metropolis Plaza. The River Rocker in County Fair would be named The American River Rocker. We aren't getting a coaster in 2020.
sfgamnut17 wrote: If/When we get a giant discovery, I would put it where River Rocker is, move the River Rocker where the Revolution is now and scrap it. I would name the new giant discovery Riddler Revenge and put it in Metropolis Plaza. The River Rocker in County Fair would be named The American River Rocker. And that’s the ongoing debate. Having been on both, they each provide a unique experience a frisbee seems to be more about pinning you against your seat and positive g forces. Discoveries are all about the weightlessness, height, and angle of swing. Me, since Maxx Force is coming then I believe it would be something small. Maybe it's a kiddie expansion or a flat ride like a Giant Discovery or a DECENT skywarp. But what I hope will happen is that Buccaneer Battle would be removed and the Go-Karts would be moved somewhere else, then that would be a good place to put a custom raptor or T-rex.